I often visit Youtube.com for sewing videos. While watching one machine quilting video, I was shocked at the body posture of the young quilter - a talented young quilter from whom we've probably all learned. She said she'd been complaining of headaches, shoulder and eye issues. Then she mentioned her own shock at seeing her own video, noticing how awkward and poorly balanced her neck/shoulders were. Because I also have neck/shoulder issues (unknown origin) I notice these things as well! I reviewed some of my Fons and Porter videos, taking note of the body posture of these quilters/sewers, and have noticed something important. They often use different machines, and sometimes they also are hunkering their head down into shoulders to "see" the needle. No one tells us these things when we buy a new machine. It's not always the posture of the quilter/sewer that causes discomfort and problems, it might be the shape of the sewing machine! Some machine have a very large, boxy front that holds your tension rings, needle threader, etc., that protrodes so far forward that it reduces your vision to the needle, leaving the sewist's line of vision hunkered down into her shoulders! Other machines are low across the arm of the machine, leaving the user with the same hunkered position. Even with a proper chair, and proper posture, and proper desk/table height, the shape of your machine might be causing YOU issues -- check yours out, especially if you spend hours at your machine. Many of us quilters are past the age of "Youth" and poor body position can cause serious spinal problems later on - you won't know it until it might be too late. Personally, I'd really like a TALL machine, and maybe there are available, I was only aware of this issue. I've asked my husband to check on my own posture periodically -- it is different when I'm piecing, than when I'm machine quilting. Yikes! On a more pleasant subject, here are 3 machine (DSM) quilting photos on my Pinwheels and 4-Patches. 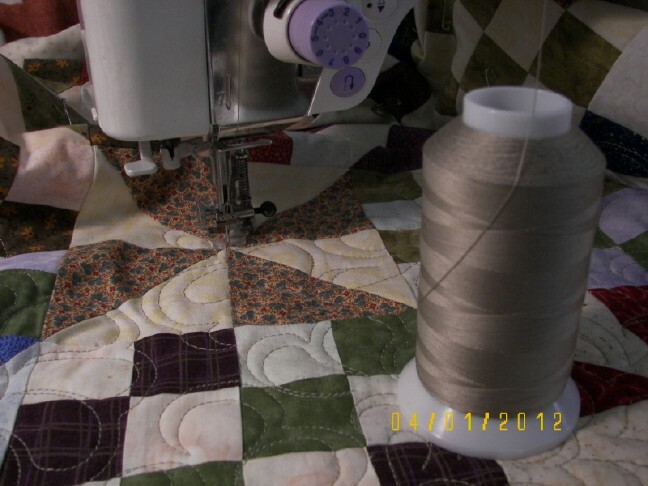 (This is the quilt where I learned about cording and piping.) This quilting thread is called "Sand", from King Tut and blends well with all the various values. I sandwiched the quilt in the garage (warm weather!) Saturday and have about half of the top quilted. The finished quilt is approximately 68" x 84". DH was kind enough (!!!!!!!!!!) to show me a "humility block" when it was too late for repairs. After my back injury 1 1/2 years ago, when I started to sew and quilt again, I had to lower my chair so that I was more at eye level with my machine. Everyone always said to raise your chair and look down on your quilting, but I was not able to do that anymore. I've had less tension in my shoulders since lowering my chair. This is something we need to be more aware of as we work--definitely! I love the design you are quilting. Is is just something you came up with, or is it from a specific source? This is a good reminder, and so true. I've learned even the need to switch feet now and then on my sewing pedal because using one all the time slightly shifts my weight unto one sitting bone. Eventually, that can put a hip into pain. It is the same for anyone on a computer... holding one arm at a raised height to move a mouse will create a big lump and pain. I so agree - my posture when sewing is not good and sitting at the computer I tend to hunch over too. Try to remind myself to sit up straight but forget when I get involved. I watched the same vid you did, but didn't make the connection. Thank you so much for pointing all this machine shape info out. I always blame "me" rather than the machines. I will look closer now and see what changes I can make. Thanks again! Your quilt is looking great! Your discussion is very thought-provoking, thank you! As for the quilting, it is simply delicious and your close-up photos really show the stitches and the fabrics well. I find myself sometimes with my shoulders in my ears. Thanks for reminding us to stop and take notice. Your quilting is wonderful. I like using that same stitch, although I tend to do mine too small and it takes forever to finish. Actually you can repair a humility block after the quilt is quilted. I know, I did it. I traced over the quilting lines on the back of the quilt with one of the blue wet-out markers. 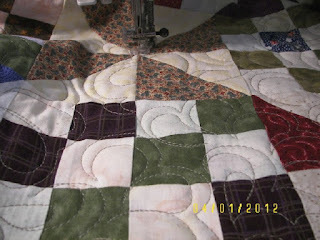 Then I picked out the quilting over that block. Next carefully pick out the block. Fix the block, in my case it was turned wrong so all I had to do was turn it. Then by hand applique or use small whip stitches and stitch the block back in place. 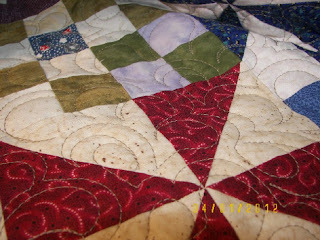 Turn the quilt over and requilt over the traced lines matching up with the other quilting. Several friends said to leave it the way it was but I am so much happier with it fixed. You have to decide what you can accept and what makes you happy. Before I fixed it everytime I looked at the quilt I saw the mistake. Now I just see the overall design of the quilt. I keep my machines at eye level. Even the computer monitor is right up at my eye level, meaning I look straight at it. Going to the gym after knee surgery, and having a trainer who scrutinized my posture, was what changed my back issues from bad to better. I've regained height, even. I agree, raise the machines to a comfortable level for your eyesight but not too high for your shoulders. It will help.